news and strategies for the evolving mortgage market JULY 2017 THEMREPORT.COM IN THIS ISSUE: 20 IT'S A JOURNEY, NOT A DESTINATION While Fannie Mae may be one of the leaders in diversity, it is not complacent, knowing the destination still lies ahead. 24 MORE THAN JUST CHECKING BOXES Diversity is more than just hiring people who look different from one another—it's a business strategy that deserves attention. 28 BREAKING THROUGH BARRIERS Today, those pursuing the American Dream have to contend with a different set of barriers. 32 DIVERSITY UNDER THE MAGNIFYING GLASS When truly absorbed, "diversity" and "inclusion" are more than just buzzwords. 36 IT STARTS AT THE TOP Executives can—and should—play a role in their organization's diversity and inclusion efforts. Freddie Mac's Dwight Robinson and other top diversity professionals talk homeownership— and how building a more diverse mortgage workforce can help Americans better achieve it. 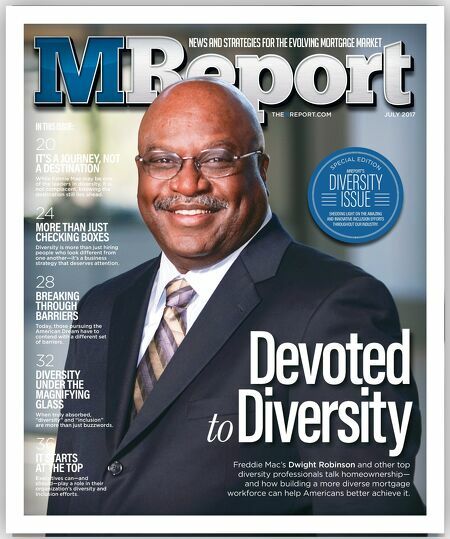 Devoted Diversity S P E C I A L ED I T I O N MREPORT 'S DIVERSITY ISSUE SHEDDING LIGHT ON THE AMAZING AND INNOVATIVE INCLUSION EFFORTS THROUGHOUT OUR INDUSTRY.